In a large bowl, cream together the paste, sugar, and vanilla. Add the egg whites ( one at a time ) and blend until creamy. Drop the batter by teaspoonful onto a lightly greased baking sheet. Top with nuts. Bake 18 to 20 minutes or until golden. Gently remove from baking sheet before cooling as they have a tendency to stick. These are delicious straight out of the oven. 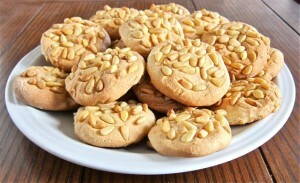 ** Tip **: The pignoli cookie is yet another southern Italian favorite. Make sure when you buy the almond paste that you’re not purchasing marzipan, which has added sugar and will ruin the cookie’s soft, slightly chew consistency.